A-5 Pad holder; also be called an A-5 leather folder. The front has a design of a colour combination in a triangular shape. It can also be made with a self colour piece. The right side has a slot for the A-5 pad. The LHS has five credit card slots and two pen loops. There is also a side pocket for keeping papers. The model can be made in different types of leathers like Cow Polished, Cow Nappa, Cow Vegetable, Buff Resin, Buff Glazed, Buff Vegetable and Cow Softy. The colours available are black, blue, brown and shades of cognac and burgundy. 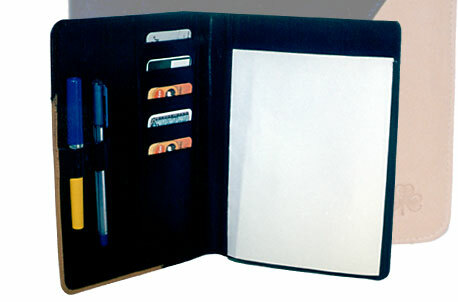 This is a leather A-4 writing case or A-4 folder with a zip closure. It has two YKK runners for closing the zip. The RHS fabric lined area has a slot for an A-4 pad. The LHS has two pen pockets near the zip area. There is a gusset or bellow pocket of size 19 x 30 cm. There is a side pocket and zip pocket 16 x 30 cm in size. 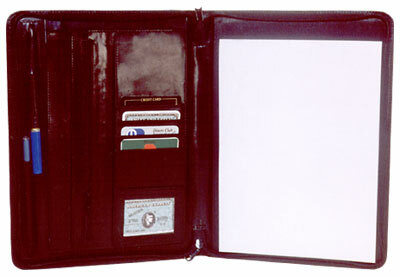 There are also four credit card slots and a window slot for a photograph or the owners card. Beneath the credit card area is a pocket of size 10 x 30 cm. The model is in Cow Polished and is available in Cow Nappa and Buff. The colours available are black, blue, brown and shades of cognac and burgundy.